Are you tired of sifting through endless dating profiles only to find out Prince Charming isn’t really 6’2” or that Princess Jasmine lied about owning that tiger? We know we are. 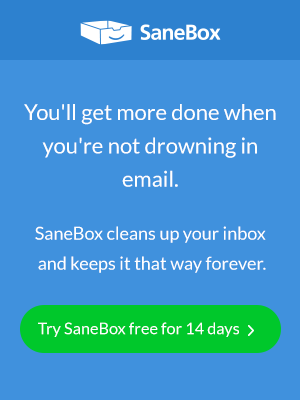 That’s why we’re excited to introduce the newest offering from SaneBox. Meet @SaneLove, our brand new matchmaker service that works right from your inbox. More than just another online dating service, @SaneLove analyzes your email habits and preferences in order to find you the perfect match. So go ahead and re-delete your Tinder. With @SaneLove in your dating arsenal, we guarantee that this time it will be a permanent delete. Great article! Online dating in general sometimes unfairly gets a bad wrap, but most people don’t realize that over 40% of new relationships world-wide are started ONLINE! There are a lot of good paid sites, and a few great free ones if you know where to look. For those who are more interested in Asian singles, the best truly free site we’ve found is http://www.Filipino4U.com There are also some good paid sites like Match or eHarmony if you are willing to pay monthly fees.